Small Tortoisehell on Sedum (reversion from 'Frosty Morn'). Fine dry weather, a cooperative back and nothing in the diary allowed me to get out into the garden for a good session today. The priority was to start digging a long broad strip so it can be used for the snowdrops and other 'woodland' plants. The grass covering it was sprayed-off in mid-August, so it is now throughly dead and ready to be dug in. The soil here is a rich dark loam, with not a stone in sight - a delight after the stony ground of Colesbourne. Eventually the back protested it had had enough of digging: the soil is heavy after all the rain we've had this week. There's plenty left to do, but I moved on to mowing the lawn. Five passes at different settings got it mown to the bone and looking scarcely less brown than the glyphosate-treated areas, but it won't be long before it's green again. Colchicum agrippinum in the first bit of border to be planted-up. The Royal Horticultural Society Encyclopedia of Conifers - an incredible piece of work by two devotees. Shortly before I left Colesbourne I was most generously given a set of the Royal Horticultural Society Encyclopedia of Conifers, by Aris Auders and Derek Spicer. Having been trying to avoid buying books in the months before I moved, and trying (not very successfully) to thin out the shelves, all the good work was wiped out at a stroke: this is a monumental pair of tomes. Measuring 33.5 x 27 x 5 cm, together they weigh no less than 10 kg! As it happens, I've lost 10 kg of weight this year, and picking the pair off the shelf reminds me just how glad I am not to be hefting that around any more. These volumes are monumental in size and weight, but also in content. The work is truly encyclopaedic, describing all known conifer species (615) plus (by the authors' own count) a staggering 8185 cultivars, of which 4795 are illustrated. There has been nothing like it in scope before and it is difficult to imagine such a work ever being produced again - on paper, at least. The images - here in one of no fewer than eight spreads featuring Chamaecyparis pisifera - are generously sized. with its beautiful spring flush of red shoots. The book is dominated by pictures, but unlike the usual miserable postage stamp-sized things, these are all reproduced at a good size, showing the plants clearly and usefully, but not formulaically. The smallest I can find are 7 x 12 cm, which is extremely generous, but there are many quarter, half and full page plates - some even fill a whole spread. Moreover, they are of uniformly high quality and enable an accurate impression of the plant to be formed. Multiple images of the same clone are often used - again an example of the generosity of spirit with which this work was conceived. Particularly interesting are images of mature specimens of species in the wild, reminding us just how big some of the rarities we cosset can become when conditions are favourable, but it's also good to see the full size and shape in maturity of some of the cultivars. My only gripe with the work is that some of the rarer species (and even genera) are not illustrated: it's a shame not to be able to see what Falcatifolium or Sundacarpus look like. Inevitably the descriptions are succinct, but each contains a useful note on the characters that distinguish a cultivar or species, and a particular effort was made to include information on the origins and/or originators of each cultivar described. This in itself is a major achievement by the two authors. Aris Auders is a Latvian conifer enthusiast, while Derek Spicer is a British conifer nurseryman based in Leicestershire, and a colleague on the RHS Woody Plant Committee. 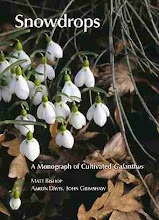 Between them their knowledge, as revealed in this work, is immense, and they must be saluted for producing a truly exceptional reference to their favourite group of plants. 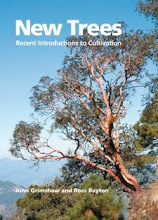 Inevitably this is not a cheap book, being offered by the RHS bookshop or through the dedicated website www.coniferworld.com for £149﻿﻿﻿﻿﻿﻿﻿﻿, but at 1507 pages this works out at a fraction over 10p per page - I think that it's actually a bargain at this price. ﻿﻿There are two other recent two-volume conifer books on the market at present: A Handbook of the World's Conifers by Aljos Farjon (£195), which is strictly botanical and sparsely illustrated, and Debreczy et al's Conifers Around the World (c. £200), which has a magnificent set of images of wild species. J. Eckenwalder's Conifers of the World is only one volume, and only £45, but largely illustrated, unbelievably, in monochrome. Conifers are sadly derided and generally ignored by the current crop of horticultural trendsetters, but this book will show anyone what a wonderful contribution they make to the garden, and I think that anyone with an interest in the diversity of garden plants needs a copy. Although my plants are still in pots where they were offloaded in the drive, they are providing a few touches of colour here and there, and some attractive and interesting things are flowering now. Here are a few. Bobby Ward's collection of Sedum palmeri, with other sedums. Heavy-horse logging - Ouragan is a very popular member of the Wild about Wood team. Wild about Wood is the Castle Howard Arboretum's annual celebration of everything to do with wood, woodland crafts and countryside traditions. With brilliantly fine warm weather the weekend got off to a great start today, with record numbers of visitors for a Saturday. Spread across the arboretum there is a diversity of activities for people of all ages and a selection of stalls and exhibits offering sand demonstrating some lovely products and skills. Details about the event (which continues tomorrow 10-5), can be found on the Wild about Wood website. Watching the falconry display by York Falconry. The Woodland Fairy (aka Katherine Forsey) meets arboretum trustees Sir Richard Storey and the Hon. Simon Howard. Conversion of logs by the amazing Wood Mizer portable sawmill, operated by Henry Brown of Grange Farm Timber. Climbing trees with Askham Bryan College. Planting plug plants in our wildflower meadow area: Paul Evans of Buglife gives guidance. The Dahlia trial on the Portsmouth Field at Wisley: plants grown to perfection. An inspection of the Dahlia trial at Wisley is always one of the highlights of late summer for me: they looked amazing in last Tuesday's bright sunshine. Here are some that caught (or blinded) my eye. The outstanding clone to me was labelled only as "48" - must get the name from the Trials Office. Beautifully groomed: the canal at Wisley. Back-to back meetings of the RHS Woody Plant Committee took me south this week. On Tuesday we met at Wisley to discuss recommendations for the Award of Garden Merit, spending a long time debating the qualities of plants proposed by working groups as part of the current AGM Review process. The committee as a whole has to ratify awards, and this meeting gave the opportunity for those who wished to raise objections or make proposals. It was a good-natured and productive session. A section of the great double borders at Wisley. Hydrangea paniculata Vanille Fraise was proposed and recommended for the AGM: here growing on Battleston Hill. Inside the canopy of the huge Catalpa bignonioides by the rose garden at Wisley. To mark the WPC's visit to Kew a young Carya cathayensis was planted, all members of the committee contributing a spadeful of soil. Tony Kirkham adjusting the plant; Raymond Evison (our Chairman) with spade. This is now the only example of the species growing outside in the UK. On Wednesday we reconvened at Kew for a formal committee meeting and study day on Juglandaceae led by Tony Kirkham and myself. We discussed the identification and diversity of the walnut family, of which Juglans, Carya, Pterocarya and Platycarya are the four genera of interest to temperate gardeners. All have potential to make beautiful trees, but many species are seldom seen outside specialist collections, possibly because they don't like transplantation or pot cultivation much. Most of us got our first sight of a specimen of the Chinese hickory Carya cathayensis in the shape of two year old plants grown from nuts sent to Kew from the Shanghai Botanical Garden. One was planted at Kew in the 1980s but soon died: hopefully these plants will be more successful. Juglans sigillata is the most recently introduced walnut: this specimen was grown from a bag of nuts sent to me in 2005, and is now over 3 m in height. Bedgebury National Pinetum seen from the visitor centre. Thursday morning found me at Bedgebury National Pinetum, Kent, to see the new propagation facility there - we are planning a modest version at the Castle Howard Arboretum. Dan Luscombe, who planned, built and runs the nursery showed me around the extremely impressive set of growing areas, where he produces large numbers of beautifully grown conifers and other woody plants each year. The majority are for use at Bedgebury, but the surplus are distributed to other collections. In recent years Dan and the Curator, Chris Johnson, have built the collection at Bedgebury to undoubted primacy in the world, with an unrivalled collection of both species and cultivars, though the Pinetum is always strapped for cash - it is sadly under-valued by the Forestry Commission which owns it. Part of the nursery at Bedgebury National Pinetum - a huge diversity of conifers. A superb group of my favourite conifer, Taiwania cryptomerioides, in a beautifully glaucous form. The first known cones in Britain on Cathaya argyrophylla, a very rare Chinese larch-relative. Cones on Picea farreri: collected in 1919 on Reginald Farrer's last expedition to Burma it was not named until 1980, and all specimens in cultivation are propagated from the single tree that survived from Farrer's seed. Succulents on the pond terrace at Myddelton House. Coming round the M25 on Thursday afternoon I bethought myself to visit Myddelton House, which lies barely a mile from Junction 25. I am a member of the Garden Advisory Group there, but as I can't make it to next week's meeting it seemed like an opportunity to catch up. E.A. Bowles said it was the driest garden in England and even after this year's rainfall it was looking rather dusty in parts. Andrew Turvey and his team are getting to grips with it and bringing it back into shape, with newly tackled areas to see every time one visits. A variegated Piper capense that I found on Kilimanjaro in 1992, now thriving (at last) in the new greenhouse at Myddelton House.